The modern Japanese artist, Sawako Utsumi, hails from northern Japan. In this article, the focus is on three recent art pieces related to stunning mountains. Unlike this art piece, the faith of Shinto played a significant part in her last two mountain themed art pieces, even if on the margins of the eye while being central overall. Utsumi based on her individual creativity and knowing the eventual linkage focuses on stunning mountains in different shades of blue. This delightful aspect ignites the art pieces both individually and collectively. In her two previous art pieces in this current trilogy titled Spirit of Ukiyo-e in the Light of Shinto and Spirit of Shinto and Ukiyo-e in the Light of Nature, the fusion of the indigenous faith of Japan and nature shone brightly. After all, the religion of Shinto is fully interwoven with the mystery of nature. Therefore, adorable Shinto shrines throughout Japan dot the landscape naturally and the spirit world of Shintoism is equally shaped by the reality of nature. Intriguingly, in her latest art piece that connects the other two, then the sole focus is nature itself. Despite this, the art piece titled Spirit of Ukiyo-e Illuminated by Stunning Nature isn’t actually excluding nature – when viewed from the trilogy and the meaning of kami. Indeed, the latest art piece is a mirage that can be viewed from the ending, or in reverse from nature to people. In other words, all people enter this world and leave based on death but in the world of Shinto the reality of life, nature, spirits, and other factors is a continuing cycle. Therefore, the kami exists even if people know little – or even if the art piece no longer connects directly to the human world. 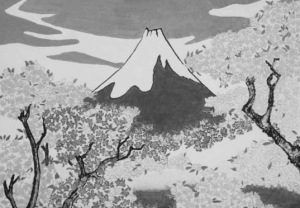 Overall, Utsumi is playing on the kami theme above, while utilizing the beauty of ukiyo-e, and illuminating this with stunning mountains that unify the bigger picture.